If you think Destin is beautiful above the water, wait until you see it under the sea. Destin looks beautiful when you can take a glimpse of it under the water. You can do just that by going scuba diving in Destin Florida. If you want to go scuba diving in Destin Florida, you might need to take lessons. You have various options for taking lessons in Destin. Let’s take a look at some of my favorites. Valentine Scuba Divers is one of the top places to take lessons so you can go scuba diving in Destin Florida. You can take a PADI Open Water Diver Course that is offered in three phases. You can take the first phase online or in the classroom. 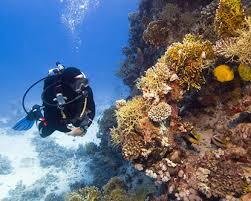 Then, you will learn basic skills through confined dives, and finally you will go out in the open water. If you want to go scuba diving in Destin Florida, you can also take lessons with Discovery Dive World. Again, you can start the process online. Then you will need to go through four adventure dives. When you finish, you will get your PADI Open Water Scuba Diver Certification. Finally, you can take lessons at Emerald Coast Scuba. You can earn a PADI Open Water Diver certification. Start with an online class and then take four open water dives. If you aren’t sure if you want to take lessons, you can go with a Discover Scuba class with Emerald Coast Scuba. Then, you can try diving without actually going through the class. You can go on a shallow water dive or take a dive in a saltwater pool. Scuba diving in Destin Florida is a ton of fun. If you want to enjoy the fun, be sure to take your lessons ahead of time. This entry was posted in Destin Florida Activities. Bookmark the permalink.